(partial) Introduction: Historical background. Postal services. Telecommunications services. Scope of this review. Main Sources: Surveys and reports by service providers - postal services. Surveys and reports by service providers - telecommunications. Available Data: Labour statistics. Current inputs other than labour. Future Needs: Publication of methodologies. Range of quality of service. 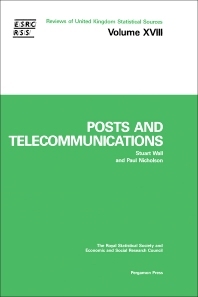 The review describes the publicly available sources of statistical information about postal and telecommunications in the United Kingdom. It covers public letter and parcel mail, postal orders, telephone, telegraph, telex, data and facsmile services. Given the 1981 Post Office reorganisation and the 1984 privatisation of British Telecom, this volume should prove a valuable resource to researchers and professionals requiring a guide to information in this rapidly changing field. For professionals in communications fields and researchers and students in economics and public administration. @qu:I found the review to be well organized, clearly documented and comprehensive in its coverage and I would recommend it to anyone wishing to pursue any research in this area. @source:The Royal Statistical Society.